If you come to visit Orlando and only have $3 dollars in your pocket, there is still an attraction that you can enjoy at the Fun Spot Attraction on International Drive. 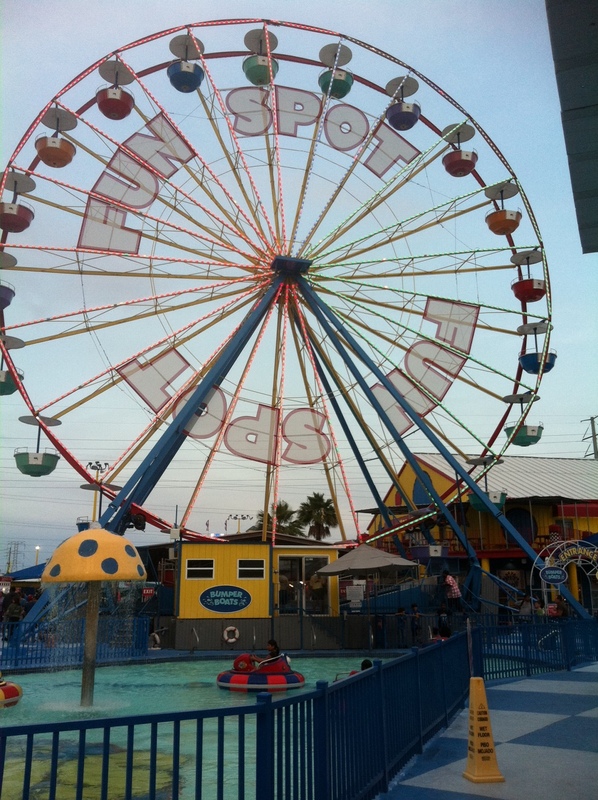 The Ferris Wheel at Fun Spot is close to the intersection of International Drive and Kirkman Road, located directly across Interstate 4 from Universal Studios. From the top of the Ferris Wheel, you can can see the top of Harry Potter’s Hogwarts Castle, the Islands of Adventure Lighthouse, and other attractions. Along International Drive, you can see Wet N Wild, the Peabody Hotel, and the Convention Center. In the distance, you can see the skyline of Downtown Orlando. Not a very happy film to say the least, but the Fun Spot Ferris Wheel also has a small roll in the movie by the name of Monster that is based on a true story, where Charlize Theron and Christina Ricci take a ride on the Ferris Wheel. In the movie, they state that they are going to Fun World, but the scene and credits definitely show that they are on the Ferris Wheel at Fun Spot. Charlize Theron won the Academy Award for Best Actress in the movie for her role in the film. At the price of $3 per person for this individual attraction, there is no better attraction to experience at a similar price point in Orlando. The Ferris Wheel at Fun Spot on International Drive is the Best Bargain Individual Attraction in Orlando. This entry was posted in Attractions and tagged best of orlando, carnivals, international drive, movies, rides. Bookmark the permalink.